So, it's been a few days since I posted, but that doesn't mean that Abby has decided to make her debut! I have decided that I must have the most comfortable belly in the world! As for my paper crafting, I am still doing that as much as possible while on bedrest, but it is hard to upload the pictures if you know what I mean! I have been doing a lot of planning for our Relay For Life Fundraiser that we have coming up in April! A Spring Fling! 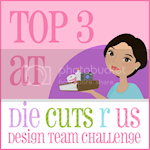 I am planning to give my comission from any Stampin Up orders collected during that time to the ACS as are our teams Home and Garden Party profits! I had mentioned earlier about blog candy and I just want to let everyone know that I am still planning to do that! I want to start during the month of March and the way to enter will be to leave your name and email address in the comment section of my blog! Went back to the Dr. today and nothing had changed. Even though I am due Friday, they went ahead and made me an appointment for next Monday because I have not dilated... ugh! I am getting so anxious for this little girl! I didn't get to do anymore crafting or scrapbooking to share, bedrest puts a damper on everything and going to the Dr today wore me out! Hopefully tomorrow will be a better day! 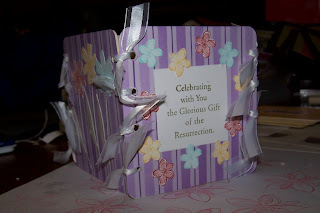 Here is my paper craft/stamped item for today: a Chipboard Coaster Box! These must be all the rave because it is hard to find the coasters! I bet some of the resteraunts are happy for the extra business it has brought in! I used 5 coasters for this box - 4 sides and 1 for the bottom. I covered the 4 sides with my paper (from Wal-Mart) first, then added the embellishments. (Whisper White Card Stock, In Color '07 Inks, and Glorious Gifts from the new SU! Spring Mini was used to make all embellisments for the box) Since I do not yet have a crop-a-dile, I made do and borrowed Gary's power tools! That's right ladies and gentlemen, the dremmel tool came out of retirement and did a great job! A big plus: being able to cut through all four layers of chipboard at once! It also helped to ensure the holes were lined up because they were cut at the same time. To hold the sides together, I cut small strips of ribbon (from Wal-Mart) to tie through each of the holes. The bottom is held on with a hot glue gun! I plan to give these to Abby's Sunday School teachers for Easter this year! Of course I will fill them with some lovely Hershey's Kisses or mini Reese cups first! This is also going to be one of my "mini classes" at our Relay for Life Spring Fling fundraiser! Good evening! Abby must think that it is too cold to come out because she's still in for now! I had plans to upload some paper craft pictures today, but alas, my wonderful husband... has lost he USB cable to the Digi cam! In other news, we did get some snow. It is on again, off again and is supposed to continue through the night and into tomorrow morning, but so far, it has already been enough for me and I am ready for it to leave until next year. I'm sure some of you can more than agree with me on that! Okay, I realize that we will be starting off pure sucky, but the best is yet to come!Keep in mind before you run with bordom, I am 39 weeks preggo, on bedrest, and have an impacted wisdom tooth that I can't get cut out until March 7th! 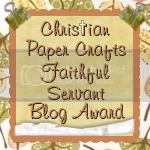 Blogger Candy offers for the loyals! Keep your eyes open!